Nassau County Executive Edward Mangano will deliver his "State of the County" address on Tuesday, March 11, 2014 at 7 p.m. Photo Credit: Newsday / J. Conrad Williams Jr.
Nassau County is working with state lawmakers on legislation that could spare the county hundreds of millions in annual costs from erroneous property tax assessments, County Executive Edward Mangano said in his State of the County address. Mangano, a Republican, offered few details about the proposed legislation in a televised 45-minute speech from The Space, a Westbury theater. 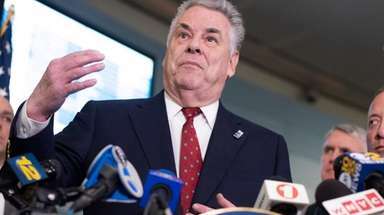 He has suggested legislative paths, including repealing the "county guaranty" requiring Nassau to pay property tax refunds to residents of school districts and other entities resulting from the county's assessment errors. "Treat Nassau taxpayers as other taxpayers are treated throughout New York State," Mangano said in his fifth countywide address, and his first since his re-election in November. "We ask for nothing more but will insist on nothing less." 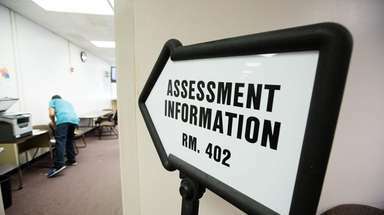 Other possible measures include shifting assessment responsibility to the towns and villages or creating an undetermined "margin of error" for assessment mistakes that would not require a refund. Democratic critics say ending the guaranty would shift costs onto school districts and local governments. "Mangano has had four years to fix the assessment system, and it remains broken and he should be held responsible," said Minority Leader Kevan Abrahams (D-Freeport). Mangano said the county guaranty was the "greatest obstacle" to meeting new financial standards imposed by the Nassau Interim Finance Authority, the county's financial control board. The State Court of Appeals last month rejected Nassau's repeal of the guaranty. Mangano said that since the ruling, he's met with state officials, business leaders and NIFA to draft a bill to "correct this billion-dollar wasteful system that places an unconscionable burden on every county taxpayer." NIFA Chairman Jon Kaiman confirmed he has had discussions with Mangano about potential assessment bills. "There needs to be a solution," Kaiman said. "It's the biggest problem the county needs to address. 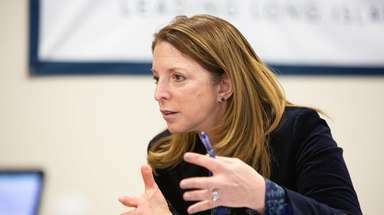 "Legislation addressing the assessment system won't be introduced before the legislative session ends in June, officials said. Mangano's speech focused primarily on his first-term record. 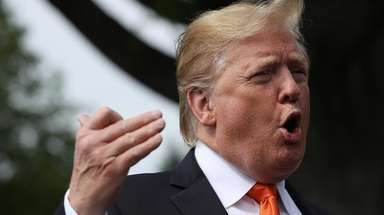 He said he has frozen property taxes, helped attract film and television productions, and consolidated six county agencies. Mangano said that since he took office in 2010, unemployment has declined countywide, while large companies came to Nassau to set up shop.Mangano said Nassau expects to receive millions of dollars in new revenue are expected from the redevelopment of the Nassau Coliseum and its surrounding land. Mangano said he is working with NIFA to lift a wage freeze on county employees "while achieving long-term structural and reoccurring savings." Several hundred union members protested the wage freeze outside The Space Tuesday night, hoisting signs with slogans including, "NIFA caused my family's fiscal crisis." Monday, NIFA extended the freeze for a fourth year but outlined several conditions that unions and the county could meet to end the freeze. Mangano also announced Nassau 200, A program to attract young professionals to live and work in the county. A panel of 200 millennials -- residents born between 1979 and 1995 -- will consult with Nassau to help determine what types of neighborhoods young people want, what areas show potential for development and how likely they would be to set up businesses in the county.